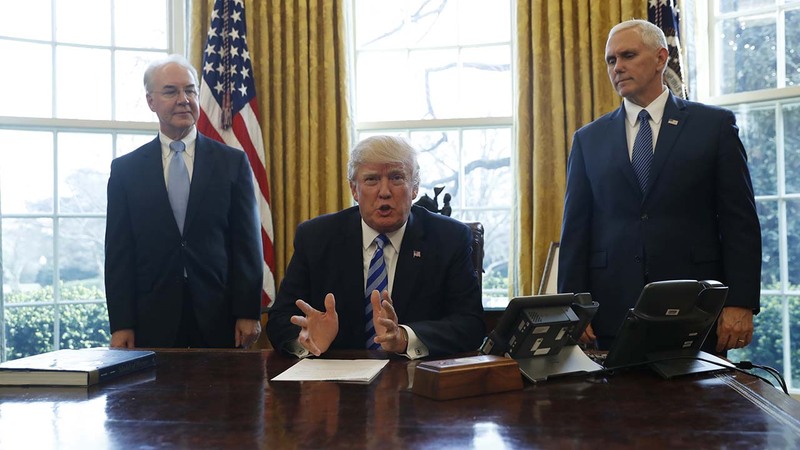 President Donald Trump, flanked by Health and Human Services Secretary Tom Price, left, and Vice President Mike Pence, meets with members of the media. Some Americans breathed a sigh of relief, others bubbled with frustration, and nearly all resigned themselves to the prospect that the latest chapter in the never-ending national debate over health care would not be the last. The withdrawal of the Republican-sponsored health bill in the face of likely defeat Friday in the U.S. House seemed to ensure that the deep divisions over the Affordable Care Act and its possible replacement will continue to simmer. As news spread, Americans fell into familiar camps, either happy to see a Democratic effort live another day, or eager to see Republicans regroup and follow through with their "repeal Obamacare" promises. Walt Whitlow, a 57-year-old carpenter from Volente, Texas, gave Trump his vote even as he came to view Obama's law as "an unbelievable godsend." He went without health coverage for nearly 20 years, but after the ACA passed, he signed up. Two months later, he was diagnosed with tongue cancer. He proclaims himself opposed to government handouts that he thinks people grow too dependent on, though he wouldn't say what he hoped would happen with the GOP bill. Still, its withdrawal brought relief for a man who says his ACA coverage kept him from massive debt and maybe worse. "It saved my life," he said. "I really don't know what to say."